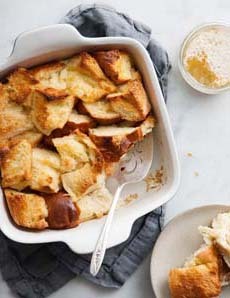 Challah bread pudding, like Challah French Toast, should not be limited to Chanukah. In terms of egginess, it’s the closest thing to brioche—and much less expensive. With Chanukah starting in two weeks (this year, it coincides with Christmas Eve), you try a batch this weekend; then adjust it as you like over the eight days of Chanukah. Serve it for breakfast or dessert. What other holiday gives you eight days of French toast and bread pudding? This recipe is ready in 40 minutes. 1. PREHEAT the oven to 325°F. Spread the challah cubes on a baking sheet and bake for 15 minutes, tossing occasionally until the cubes are dry but not brown. Remove from the oven and cool for 15 minutes. 2. ADD the raisins and bourbon to a small bowl. Microwave for 30 seconds; set aside. 3. COMBINE the brown sugar and 1 tablespoon of the granulated sugar in another small bowl. Set aside. 4. BEAT the egg yolks, 3/4 cup sugar, vanilla and salt with electric beaters or a whisk. Beat/whisk in the cream and milk until combined. Add the raisins and bourbon. 5. RESERVER 2 cups of the prettier challah cubes for the top layer. Stir the remaining cubes into the egg yolk mixture and pour into a 13″ x 9″ baking dish. Set aside for 30 minutes so the bread is fully saturated by the custard. 6. DIP the remaining challah cubes into the melted butter and place evenly, butter side up, on the top of the pan. Sprinkle the brown sugar mixture on top. 7. BAKE for 50-55 minutes until custard is set (pressing the center of the dish does not release any liquid). Cool for 45 minutes and serve warm. There are two words for bread in Hebrew: lechem, the everyday bread, and challah, the sabbath bread. Jewish custom requires that Sabbath and holiday meals begin with challah. Challah is a braided, honey-sweetened egg bread made from wheat flour and topped with an egg white wash. The word refers to a tithe of bread that was given to the priests, who had no income. A portion of the dough was sanctified and tithed, the remainder was given over for ordinary consumption. Traditional challah is made from wheat flour, although some modern bakers make it from spelt, whole wheat, gluten-free flour, even sprouted wheat. They can be plain or mixed with raisins and other dried fruit. On the savory side, onions and herbs can be added to the dough; sesame or poppy seeds garnish the top of the loaf. The shape can be oblong or round, depending on local traditions. Another variation is the number of braids: traditionally three or four braids; more recently two-braid loaves have appeared. The bread pudding from today’s recipe (photo #1, #3 and #5 courtesy Good Eggs | SF). 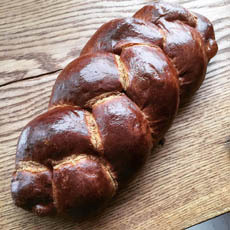 Braided challah (photo courtesy Hewn Bakery | Chicago). 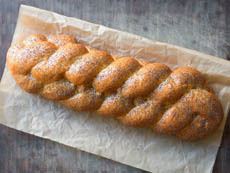 Braided challah with poppy seeds. 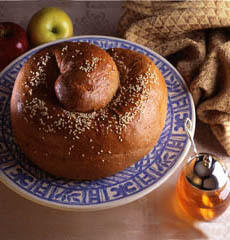 A Sephardic turban challah with honey (here’s the recipe; photo courtesy National Honey Board). A round with raisins (photo courtesy Good Eggs). Irresistible: chocolate-orange challah from Yin and Yolk. In more recent times, pull-apart loaves and challah rolls have become popular. During the holiday season, some bakers and home cooks make Chanukah loaves are shaped like menorahs. Today, people of all faiths enjoy challah, at any time of the day. One of our team brought in a challah made with pumpkin seeds and chia for our afternoon tea. 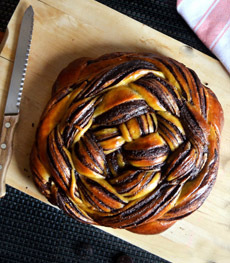 And for breakfast and snacking, check out this gorgeous chocolate-orange challah. Go seasonal with this recipe for challah made with butternut squash and sage. Check out this rainbow challah, made from six braids, each a different color. It’s a dazzler. And here’s how to turn a challah into a special centerpiece for the breakfast table or a buffet. So much challah, so little time. 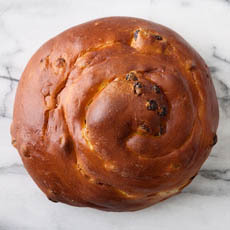 We’re off to buy ingredients for Yin and Yolk’s stunning chocolate orange challah. Note to NIBBLE team: Don’t expect there to be any left over on Monday.